A parliamentary report of 1777 recorded parish workhouses in operation at Budock (with accommodation for up to 15 inmates), and at Penryn (up to 50 inmates). Penryn had a workhouse on Church Lane from 1821 onwards. Edward and Mary Tregaskis were governor and governess from 1821 onwards. 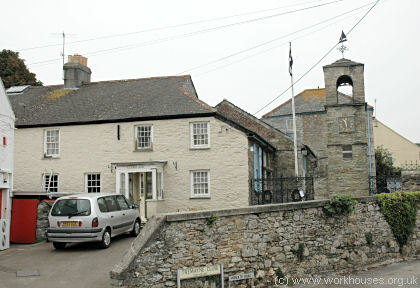 Mylor had a workhouse on Lemon Hill at Mylor Bridge dating from 1827. The building was converted to a National School in around 1850. Falmouth town's workhouse stood at the east side of Gyllyng Street. Cornwall: Budock (2), Constantine (2), Falmouth — Town (4), Falmouth — Parish (3), St Gluvias, Mabe, Mawnan, Mylor (3), Perranarworthal (2), Penryn (4). The population falling within the Union at the 1831 census had been 20,816 with parishes ranging in size from Mabe (population 512) to Falmouth Town (4,761). The average annual poor-rate expenditure for the period 1834-36 had been £5,050 or 4s.10d. per head of the population. Initially, Falmouth Union retained three existing parish workhouses — Falmouth Town (for up to 108 inmates), Falmouth Parish (60 inmates), and Penryn (96 inmates). At Penryn, Edward and Mary Tregaskis continued in post but were known as master and mistress of the workhouse. They were forced to resign in 1851 because Edward had been found guilty of beating a pauper boy. Mr J. James succeeded them as master. From late 1840, the master and matron of the Falmouth Town workhouse were Thomas Deeble Smith and his wife Eliza. At the Falmouth Parish workhouse, the matron up until 1852 was Sarah Godolphin. A two-storey entrance block originally stood at the west of the site. It had an arched gateway at its centre. 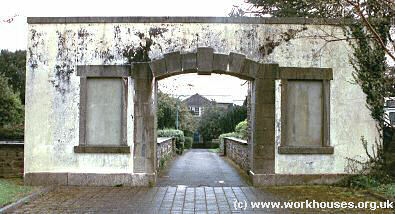 Falmouth remains of entrance archway from the west, 2001. The main accommodation range was an E-shaped layout, three storeys high. Falmouth workhouse main block from the north-west, 2001. 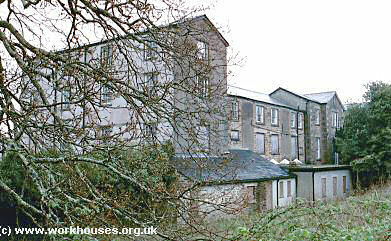 Falmouth workhouse main block from the north-east, 2001. The first master of the new workhouse was Mr James, previously in charge of the Falmouth Town workhouse. After 1852, the latter was used to house child paupers. In 1861, the inmates number more than 100. The building subsequently became a British School. It was then purchased by the Falmouth Schools Board in 1898 and became Smithwick School, which was used for various educational purposes until its demolition in the 1970s. In 1871, a small block containing infectious wards was erected at the north-east corner of the new workhouse site at a cost of £500. In 1894, the British Medical Journal set up a "commission" to investigate conditions in provincial workhouses and their infirmaries. Following a visit to Falmouth, the commission's report found that just one nurse, untrained, was employed for the whole infirmary, with paupers as her assistants. She also acted as the workhouse's midwife. There was no night nurse. If a doctor was needed at night, he was fetched by a messenger on foot — a distance of nearly two miles into Falmouth. Although sick inmates were generally well cared for, the infirmary buildings were too old and inconvenient for their purpose: the wards were small and lacked basic amenities such as baths and hot water. The construction of a new and properly staffed infirmary was recommended to serve the needs of the sick poor of the town and its neighbourhood. Further details are available in the full report. In 1897, perhaps in response to the BMJ's report, a new infirmary block costing £2,148, was erected at the east of the workhouse main block. Falmouth infirmary block from the west, 2001. The institution was later called Budock House, then following the inception of the National Health Service in 1948, it became Budock Hospital. In 2001, the former workhouse buildings were lying disused but have now been demolished and the site is being redeveloped as a housing estate. By the 1920s, the union was operating a children's home at 11 Clare Terrace, Falmouth. The building still exists, now in private residential use. Cornwall Record Office, Old County Hall, Truro, Cornwall, TR1 3AY. Relatively few records survive — holdings include Guardians' minute books (1839-1930); etc. Thanks to Ruth Hodges (descendant of Edward and Mary Tregaskis) for information on Penryn.